A woman falls as refugees with their children run away after Macedonian police used tear gas to dispearse refugees trying to break the gate to enter Macedonia, Feb. 29, 2016. Hundreds of migrants and refugees tried to break through a border fence into Macedonia from Greece Monday as frustrations boiled over at restrictions imposed on people moving through the Balkans. Macedonian police fired tear gas as a group of some 300 Iraqis and Syrians forced their way through a Greek police cordon and raced towards a railway track between the two countries. "Open the borders!" they shouted as a group of men used a metal sign post to bring down a section of barbed wire fencing into Macedonia, prompting police to fire volleys of tear gas and preventing them from crossing. At least 30 people, including many children, requested first aid, the charity Doctors of the World said. The crossing is next to the main transit point for refugees traveling towards western Europe. Close to 10,000 people have been stranded in the small transit camp designed to hold 2,500 for brief stays. Struggling with limited resources to house migrants itself, Macedonia had briefly closed its border last week, only to re-open it but with much stricter controls, allowing only a few hundred people to pass through over the weekend - not enough to alleviate the constant influx of new arrivals as thousands come to the Greek mainland by ferries and immediately head north. In a sign of widening divisions within the European Union, German Chancellor Angela Merkel lashed out at Austria and Balkan states for abandoning debt-laden Athens to refugee chaos. Anti-riot policemen face migrants during the dismantling of half of the "Jungle" migrant camp in the French northern port city of Calais, Feb. 29, 2016. 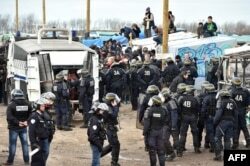 Meanwhile, in Calais, France, workers began pulling down tents and makeshift shelters in a sprawling refugee camp, dismantling the fragile structures that have served as temporary homes for migrants hoping to make their way to Britain. A flashpoint on the edge of the Channel, the camp sprang up less than a year ago in the port city, which has both ferries and the Eurotunnel rail route to Britain. It has grown explosively in past months amid Europe's migrant crisis, fueling far-right sentiment in both Britain and France. Some 4,000 people are estimated to live in the camp - down from 6,000 in December. Calais has lived with migrants in its midst for years, but the current camp on the city's edge sprang up around a day center opened last April by the state - and after small camps inside the city were bulldozed. The dismantling of the dense southern portion of the current camp would be the largest such operation the city has known. Scores of riot police stood guard, keeping journalists and volunteers out as helmeted workers tackled the shelters one by one.